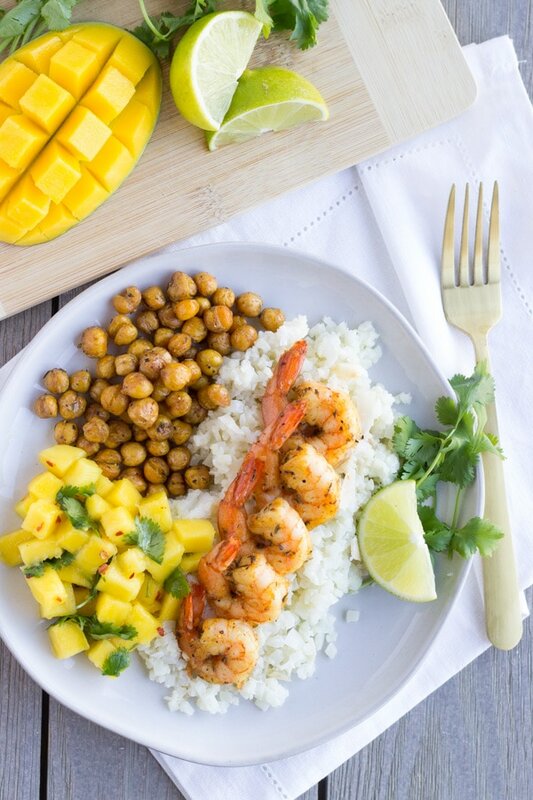 All the Summer feels with this dish of Jerk Shrimp on top of coconut cauliflower rice, spiced chickpeas, and a refreshing mango salsa. It’s the perfect summer dinner because you’ll still feel great after eating it and the cauliflower rice has far less calories than regular rice. It would also go great with a pineapple salsa, or chicken instead of shrimp. I made the jerk seasoning with spices I had in my cabinet and stored the leftovers in a small jar. I only had a pound of shrimp, so I needed to make it stretch for 4 people. I decided to roast a can of chickpeas with the same jerk seasoning I used for the shrimp. It made the meal nice and filling without feeling deprived of shrimp. I’ve made a similar dish with coconut rice, but since I’m trying to eat fewer carbs at night, I decided to try coconut cauliflower rice instead. For the first time making this, it turned out really good. The flavors reminded me of Thai sticky rice with coconut milk. The jerk shrimp cooks very fast and I recommend serving it right away. Prep the roasted chickpeas first, since these take about 20 minutes. You can add the spice mix to the shrimp and a some oil, mix well, and set aside. Make the salsa with either mango or pineapple, and cook the coconut cauliflower rice. 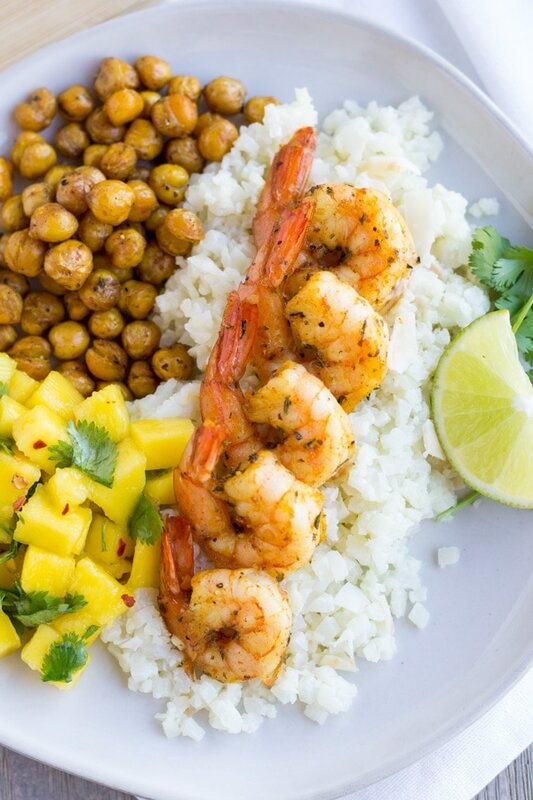 Assemble your plate and place the cooked jerk shrimp on top of the rice so it can soak up the flavors of the jerk shrimp. If you decided to make this recipe with Chicken, then I would recommend marinating the chicken for at least an hour or longer if you have the time. 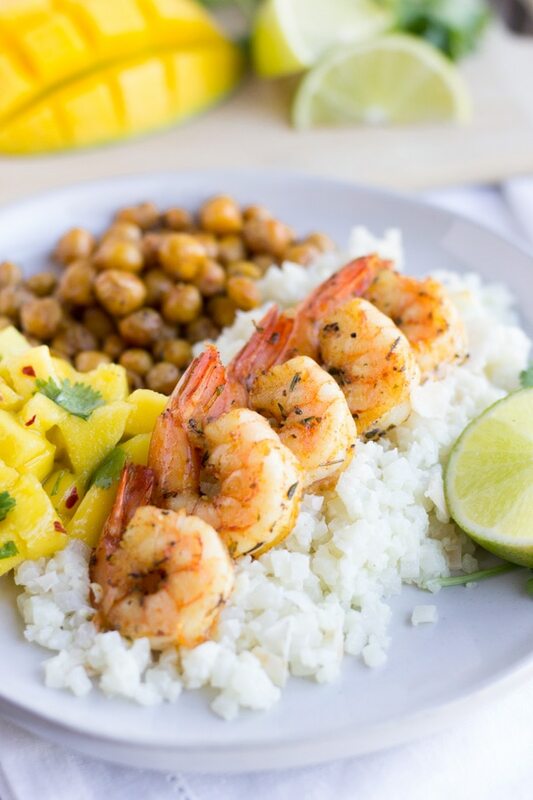 Serve it with a squeeze of lime on top, and you have a tropical inspired meal that’s flavorful and filling. Preheat oven to 400 degrees. Drain a can of chickpeas and place on a large baking sheet with oil and Jerk seasoning. Mix well and bake for 20 minutes or until crispy. Peel and de-vein shrimp and mix with oil and jerk seasoning. Empty a 12oz bag of frozen cauliflower rice into a skillet with oil over medium heat. Cook for a couple minutes for water to steam off. Then add coconut milk and salt to taste. If you have coconut flakes you can add some in. Bring to a low boil, then remove from heat. Heat a skillet over medium high heat, add shrimp, don't over crowd pan. Cook for about a minute or 2 on each side, until no longer opaque. Remove and place on top of cauliflower rice. Serve with chickpeas, mango salsa, and a squeeze of lime. Looks delicious, Renée! Your photos are beautiful too!